These are the mitts and slipper designs I’ve chosen from designers participating in the 2016 Indie Design Gift-A-Long. Again, I’ve tried to pick a mix of different techniques. If you have any favorites not listed, please post a comment with the name and/or link! 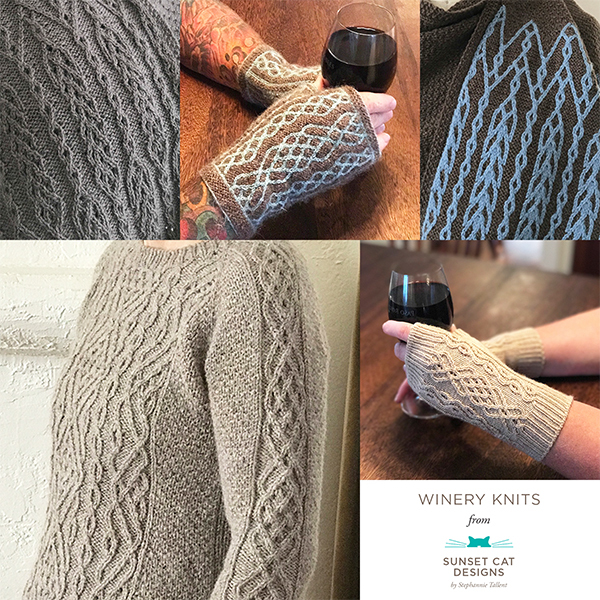 This lovely stranded mitts pattern includes a detailed essay on Castle Fraser and the specific woodcarving that inspired these mitts. Aurelie also includes detailed tips on yarn dominance, reading charts, color management, Latvian braids, and more. This pattern is worth it just for the tips! The mitts are lined with a single color knitted mitt, so you don’t have to worry about tacking down long floats. The colorwork pattern is charted. Doreen has multiple patterns that include interested layering of color blocks that I find very interesting! These patterns also let you play a lot with color choices (as well as letting you use up those partial balls of yarn). These mitts have a fun flap that will keep your hands extra warm, and nice welted cuffs. I love novel hearts pattern of these mitts. Obviously they’d be a great Valentine’s gift as well! Both the right and left mitt are fully charted (minus the ribbed cuff). One size, women’s medium, is offered. Side comment — the layout and graphics of her pattern are lovely and add to the enjoyment of this pattern! These slippers look so cozy…I know my mom would love a pair! They’re offered in 3 different sizes (based on foot circumference); Jane also includes a chart with references to finished length for women’s and men’s sizes. She includes detailed instructions on the Turkish Cast On. The fold over cuff features a pretty textured pattern….and I bet if you wanted to do cables, or any other sort of stitch pattern, it’d be pretty easy to sub in whatever you’d like, expanding the usability of this pattern. The idea behind this pattern just makes me smile (no, you’re OTHER left!). If you didn’t want to do stranding — the design includes many long floats — you can use the charts as a reference for duplicate stitching. Two different sizes are offered. These mitts just take my breath away. They are so lovely, with the lacy, beaded overlay. Four sizes are offered. The inner, bulky weight mitten is worked first (and can be worn by itself). The lace overmitt is worked second, and buttons onto the inner mitten. The pattern is well laid out, with multiple photos of the various details. The lace pattern is both charted and written out line by line. Carol designs exquisite patterns that utilize her equally amazing yarn. Her Kilim mitts, featuring traditional motifs, let you use up to 11 colors, if you work them as shown, above. She also gives directions on how to work them in two colors. The mitts are offered in one size, and are completely charted, with supplemental information written out. Be sure to visit the Indie Design Gift-A-Long group on Ravelry to join in the fun! Games, prizes, and encouragement!